A masculine white tungsten ring that is bold and classic. The center part has a soft matte finish and the drop down edges are in high polish finish. Our white tungsten rings have the same color as any white gold jewelry so you can get this ring to match any white gold jewelry to make a set. Unlike gold or silver rings, white tungsten rings do not turn color or bend so it will look the same many years to come. 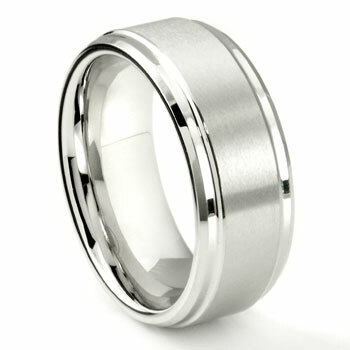 Get this 6MM white tungsten ring to make a set. Rating: 5 / 5 , based on 8 reviews. I am not big on jewelry and if its not comfortable to wear i wont wear it! This ring fit and feel great! It does not hang up or have edges that dig into my fingers. Thanks Titanium Kay, great work! The looks, the comfort, and the price were all perfect. Wonderful ring. Absolutely perfect- from ordering to delivery. The ring is beautiful & actually exceeded my expectations. Thank you so much! This is the second ring I've purchased from TK. The first no longer fit due to weight loss. Pictures don't due it justice as this ring is beautiful! I couldn't be happier with my new ring! My husband's original wedding band is 14kt yellow gold. Recently his skin has started to react and leave a small rash. He had stopped wearing it and missed having the ring but didn't know what else to do. I bought this Tungstun ring because it is great for skin sensativity and does not eaily scratch. I received the ring yesterday and gave it to my husband. We were both really impressed with the weight and look of the ring. It is so smooth on the inside and fits him perfectly. We both think it looks elegent and we are very happy with it. I ordered this ring for my fiancé and it's perfect! He loves it..This is the second ring I have ordered from Titanium Kay, great price and excellent customer service! I am completely satisfied with my new ring. I give it 5 stars. I was afraid I would mark or scratch it as I deal with steel all day at my job. I have yet to put a scratch or a mark in it. My fiancé and I are getting married in a month and a half and his ring came in two days ago! He loves it so much he's wearing it on his right hand until the wedding day. I didn't expect it to as heavy as it was, which was a wonderful bonus! I also had my fingerprint engraved on the inside of his ring and it couldn't look better. Great service, great company, great ring.